“We are allies” is more than a team motto — it’s a reminder of the true partnership. Each team member is autonomous — everyone voluntarily comes together to work towards a shared ambition. But what happens when resentment takes over? That’s the problem when one teammate bears a grudge against another — a small incident quickly escalates and tears the team apart. Unforgiveness drives toxicity — it turns team members into foes. Last week, I was working with the leadership team of a successful financial services company — tensions were growing as fast as its revenue. People didn’t trust each other and had a hard time looking each other into the eye. It all started with a small issue that was never addressed. Spiraling emotions have magnified perception — forgiveness felt more and more difficult as time went by. Holding on to negative feelings encourages disengagement, lack of collaboration, and aggressive behavior. Carrying a grudge increases stress, hostility, and the desire for revenge. Not addressing forgiveness makes things worse. A new study supports the power of forgiveness to improve well-being and productivity in the workplace. A lack of forgiveness negatively affects the individuals involved and organizations as a whole. However, organizations are skeptical, as Michael Stone explains here — executives see forgiveness as an abstract or religious concept that has no place in the workplace. The author cites interviews he held at NASA — they were afraid that forgiveness could promote a permissive culture. Forgiveness doesn’t mean lowering the bar — creating a safe space and excellence go hand in hand. When people don’t forget, they cause more harm to the team. Most toxic cultures are based on resentment and blame — unforgiveness fuels animosity and individualist behaviors. You can’t expect your team to collaborate if they hold grudges toward one another. The lack of forgiveness affects all levels. When under attack, individuals embrace selfish behaviors — ranging from alienation, fear or self-esteem. The team and the organization quickly catch up toxic behaviors. Forgiveness is an effective coping tool — it helps repair relationships and restore trust. Holding a grudge against a colleague or the organization gets teams stuck. Instead of facing conflict, they focus on blaming other. Unforgiveness harms people, not just the team — resentment activates all the chemicals of a stress response. When people are upset, they stop using their minds — fMRI studies showed that anger and vengeance inhibit rational thinking. The defend-and-attack mode fuels more toxicity — surviving becomes more important than doing great work. People start playing politics and the blame game. Conversely, the tasks involved in the process of forgiveness activate the areas of our brain linked to problem-solving, morality, empathy, and cognitive control of emotions. Research by the Stanford Forgiveness Project shows that forgiving elevates our mood and increases optimism. 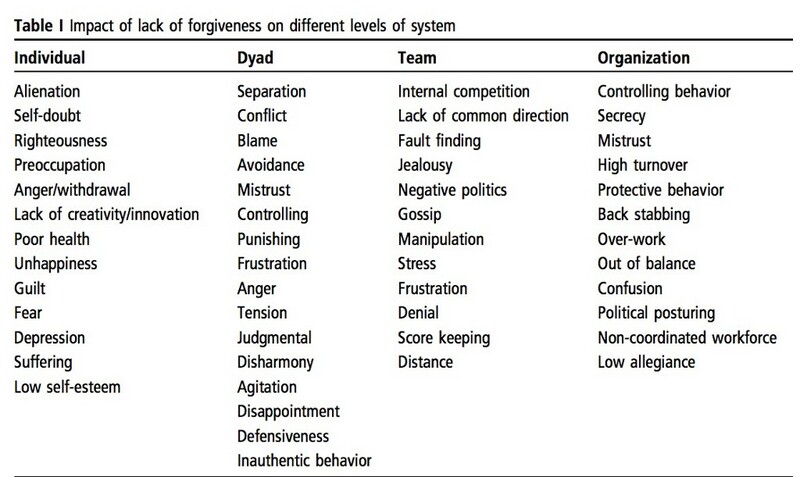 Forgiving teams are more open to learning and improvement — they don’t let past events define their present. Forgiveness is a muscle that we can all strengthen. Dr. Shawne Duperon founded the Project Forgive Foundation to teach leaders about the importance of incorporating forgiveness into organizations and leadership. They provide empathy and purpose. They acknowledge the trauma, harm, and injustice that someone suffered, but avoid fingerpointing. They turn an incident into an opportunity for understanding and growth. They provide justice and support. Leaders can be fair and forgiving at the same time. Showing support to the wronged party is essential. However, their language should help restore trust — compassion, humility, and courage promote healing. Building a culture of forgiveness requires reframing our relationship with both the wrongdoer and our emotions. Uncover the anger: Explore different points of views of what led someone to act in a particular way. Through self-awareness and understanding, we learn how the wrongdoing has affected our lives — facing our anger helps us move on. Decide to forgive: View things as less personal — you forgive the person, not the act. Making an explicit commitment to forgive others requires courage. But it’s the first step toward moving on. Reframe the emotions: Reframe your view of the offender. Once again, you are not condoning or justifying — you want to release yourself from the emotional prison. We transcend our pain by turning an offense into a lesson that helps the entire team grow. A culture of forgiveness is contagious. Everyone in the team can sense when no one trusts each other. Conversely, people will notice when they start forgiving each other. Give your colleagues the benefit of the doubt. Understand their real motive. Most of us never see ourselves behaving in a way that’s unacceptable — but we see others when they do so. A proactive approach to forgiveness is always more effective. However, if your team or organization is suffering from toxic behaviors, you might need a more structured intervention. Whether you are a team leader or member, your behavior matters. Promoting forgiveness start with you — embrace being vulnerable. Take responsibility for your mistakes. Be forgiving of yourself and others. Let transparency and personal accountability inspire growth, not blame. Create the right environment for your colleagues to feel safe — avoid attacking those who make mistakes. Provide opportunities for candid conversation — let people own and overcome their mishaps. If someone caused you harm, give them the chance to apologize and improve their behavior. Empathetic listening and kindness have a great ROI. Mistakes are a necessary component of innovation. Unfortunately, many companies have a hard time accepting their employees are human — they expect everyone to be flawless. To succeed in a fast-changing world, experimentation is essential. Don’t judge people because they make mistakes, coach them to learn from them. Leaders make mistakes all the time; great leaders turn mistakes into a lesson. Forgiving is not easy. Recognize it does not occur quickly. Allow time for grieving — let people move from uncovering anger to reframing their emotions. That the offender feels sorry is not enough. Most people have difficulty forgiving — they want justice. It takes time to overcome one’s feeling and acknowledge that forgiveness doesn’t mean condoning. When things are out of hands, you might need outside help to address conflict and forgiveness. Expert coaching and a structured program can stop the bleeding and promote understanding. Multiple studies show that interventions are very effective to train people to forgive. Rituals are a powerful way to unite a team through a shared behavior. They invite teams to start over from a clean slate. In my experience, they never go wrong. To turn foes into allies takes times. The path to recovery requires acknowledging what’s working — shift the focus from the negative to the positive. Rebuild trust by encouraging people to work on a common task or by practicing giving. Find ways for offenders to serve others. Create a space for emotional reparation by building on the positive. The Appreciative Inquiry method is based on the premise that every team has things that work already — positive stories boost confidence. Unforgiveness fuels toxic organizational cultures. Forgiving leaders encourage innovation and risk-taking. Forgiveness does not mean condoning or accepting bad behavior as I wrote here. A culture of forgiveness promotes self-awareness, vulnerability, and empathy — it promotes experimentation, not perfectionism.